DeSilva+Phillips acted as Advisor to the Company and will continue to advise the Company in their next capital raise. VeoMed is an Open Access education and communication platform designed to facilitate better information sharing worldwide. VeoMed is building the world’s largest living Open Access library of medical knowledge in the form of videos, PowerPoint presentations, and images. 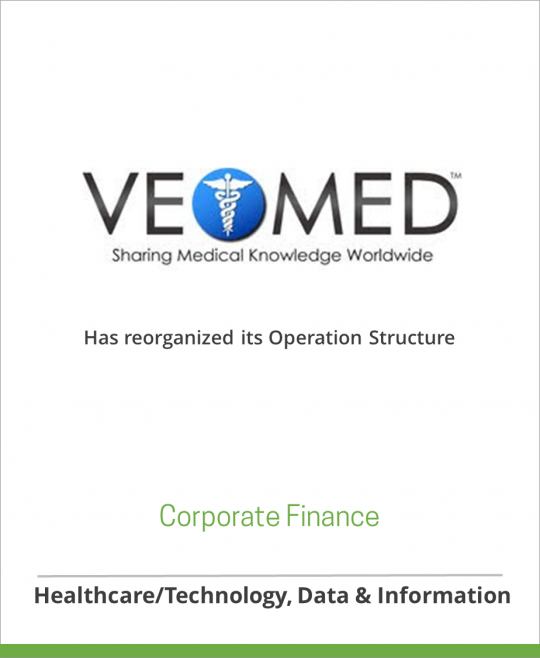 The VeoMed platform allows users to upload, store, and share unlimited numbers of articles, dialogue, and receive updates from organizations and other members. VeoMed is dedicated to healthcare professionals, academic institutions, medical organizations, and anyone with the goal of advancing or learning about medicine. VeoMed users are not only able to access VeoMed’s library of articles, but they are also able to participate in sharing their own articles, lectures, grand rounds, and symposia with a growing community of like-minded professionals and medical organizations. VeoMed partners with medical organizations to build custom technology solutions to meet their specific needs. On the VeoMed platform, organizations are able to build online communities for their products and services, host live webinars and discussions, and provide continuing medical education. While ROI is the promise, VeoMed’s passion lies in helping our partners to better share their medical knowledge worldwide.